Dante Apartment is an elegant apartment located on the second floor of a beautiful building in Nice. With internet, heating, 2 bedrooms, 1 bathroom and only 200 metres from the beach, this is a wonderful apartment for families or groups of friends looking to enjoy a holiday discovering Nice in the Cote d'Azur. There is a lift in the building. Dante Apartment is a spacious second-floor apartment in Nice. 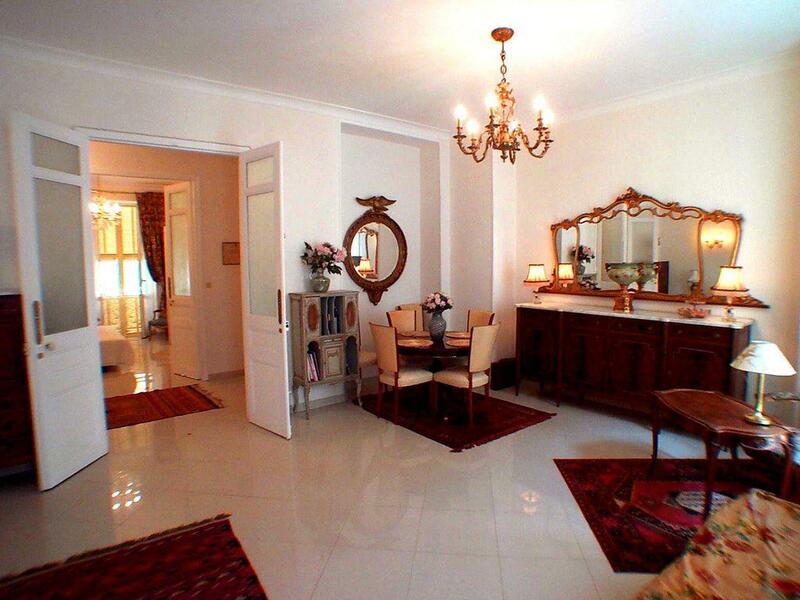 It is furnished throughout in the Louis XVI style, with 2 double/twin bedrooms to accommodate from 2 to 6 people. You will enter the building through massive double doors, into a marbled-floor hall with ornate ceilings and either walk up the marble staircase, or take the charming old lift to the second floor. There is an entry phone system in the building. You enter Dante Apartment through tall double doors, into the very spacious, light and sunny apartment which boasts high ceilings and generous-sized rooms with a marble-tiled floor throughout. There is a large hall with elegant double doors to one side, giving access to the large sun-filled and South-facing lounge, with a stylish dining area (some 28m² or 300 sq.ft.). There are two pairs of full-length French windows - one pair has an ornate wrought-iron balustrade/balconette facing the street, the other pair allowing you to step out onto the balcony overlooking rue Dante, and giving you a good view up and down the street. It is always fascinating to observe the local "Niçoises" going about their daily lives. Because the apartment is what the French call "traversant" (running from the front of the building through to the back), you have light from the South and North and through-air - very important on hot days and nights. All of the windows and French doors have the traditional louvred shutters to keep the apartment cooler on very hot days. The kitchen is typically French, with room to sit for breakfast. There is a fridge/freezer, cooker with oven and hob, microwave, electric kettle, toaster and cafétière, as well as a washing machine, iron and ironing board. The apartment has a large, well-fitted traditional bathroom with a full-size window, full-size bath with shower facility and hand basin. A hairdryer is provided. There is a separate toilet room with a hand basin, and both the toilet and the bathroom can be accessed at all times of the day or night without disturbing each other. There is also central heating if you should ever need it. - 2 single beds, you can place the 2 singles side by side to create a double. - Bath with shower, the toilet is in a separate room. This is a gracious “belle époque” apartment building with its stone façade, balconies, traditional louvred shutters, handsome solid front doors, marble staircase, charming old wrought-iron and mahogany ‘Edwardian’ lift and high ceilings – this Nice apartment would grace the smartest Parisian street. This is a real “town” apartment, yet is situated just 200 metres from the world-famous Promenade des Anglais, Mediterranean and the beaches, and just 400 metres from the renowned Negresco Hotel ( the wedding cake hotel ) and the Musée d’Art et d’Histoire (Palais Massena) in one direction and the Musée des Beaux-Arts at the same distance in the other direction. Within 150 metres you have La Cité de la Buffa, the biggest covered market in the centre of Nice with over 40 stalls selling top quality fresh produce and a wide range of local specialities, and all the restaurants, cafés and bars you could possibly want and also a large supermarket. The apartment is ideally placed for you to enjoy Nice and all of the French Riviera. A car is definitely not required although there are parking meters in all the streets around and there is a multi-storey car park within 200 metres should you arrive by car or hire a car whilst you are here. By taxi, hire car or private car, the property is conveniently only seven minutes from Nice Airport. All the many attractions of Nice – the fascinating Old Town, the Marina (Port), the Chateau Hill, museums, galleries and concert halls, the beautiful Place Massena with its impressive fountains, hundreds of charming restaurants, brasseries, bars and pavement cafes, and every type of shopping you could wish for - are within walking distance and no fewer than 8 bus routes pass the door should you wish to go further afield. Parking place available at 15€ per day - much less than other parking in Nice. There is WIFI available, a CD/tape player/radio, DVD and a television, should you have time to watch it! All the furniture and furnishings throughout the apartment are in the Louis XVI style and there are chandeliers in every room - even the kitchen and the bathroom. Apartment with a classy decor, recommended for those who like admiring antique furniture and style in the company of others.. The pictures provided show the real image of the place. Located almost in the heart of the city, will be appreciated by those who admire the urban vividness on Nice. Rooms are spacious, well equipped, the place offers all amenities tourists can need. We stayed there once with our friends and liked it very much.